CES Unveiled@NY '07: Point and click coming to set-top boxes? Wandering through the exhibition hall at the CES event was somewhat reminiscent of visiting the bazaars of ancient times. All around you, vendors hawked their wares, unashamed to snare you in innocuous-seeming conversations that turned out to be mere prelude to drawing you into their wonderful world. 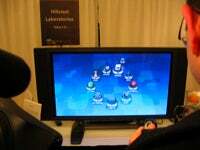 Among the most interesting things I saw demoed was a system created by Hillcrest Labs. They mainly design software for embedded use in things like DVRs and media adapters, but they've also branched out into the connected field of remote control. They were showing off their new Freespace remote, which they claim is "the first pointer-based interactive media system for TV." What I saw of it was very cool, and far and away superior to the kind of interfaces you'll find in most set-top boxes nowadays. Besides just having a pointer-based system, it also uses metadata behind the scenes to let you navigate from, say, a movie to other movies featuring the same actor—or to the soundtrack for that movie. I didn't get a chance to play with the remote (it was being used by someone else for, er, quite a long time ), but what I saw was pretty cool. The picture above doesn't really capture it, so I took a short movie, which you can see after the jump. The Hillcrest rep assured me that they had deals in place to use their software, and when asked about Apple's forthcoming iTV device, he asserted that they didn't see it anyway as competition for what they're doing. Good news all around, media fans.